The Golden Hotel, overlooking scenic Clear Creek and the Rocky Mountain Foothills, is conveniently located in the heart of historic downtown Golden, Colorado. 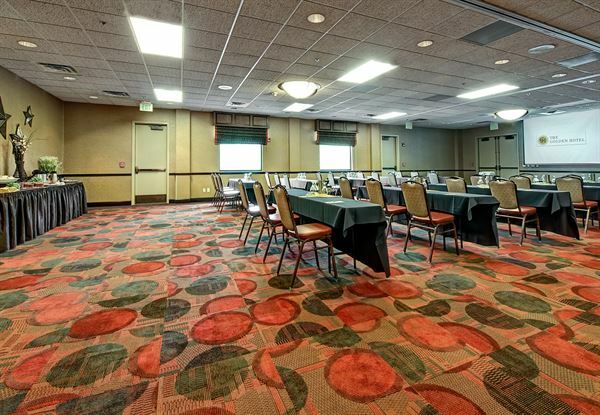 Our mountain lodge ambiance will instantly put you at ease and our full-service amenities are designed to meet the needs of both business and leisure travelers in Golden and Denver. Whether you're looking for your ideal wedding location, a place to hold a business meeting or just enjoy a quick mountain getaway, our hotel staff's personalized service will take you to a different place and time. The package includes: • Breathtaking outdoor ceremony location on our Creekside Courtyard • Private ceremony rehearsal • Golden vista reception • Champagne toast for all of your wedding guests • Elegant glass centerpieces & select linens and napkins • Cake cutting and bartending service • Parquet dance floor • Creekside suite for newlyweds on their wedding night • Discounted accommodations for your overnight guests in our spacious guest rooms & suites Please review our attachment for more options. Prices exclude a 21% service charge and 7.5% sales tax. The package includes: • Breathtaking outdoor ceremony location on our Creekside Courtyard • Clear creek ballroom for your reception up to 142 guests • Indoor/outdoor reception option with use of west patio • Champagne toast for all of your wedding guests • Elegant glass centerpieces & select linens and napkins • Cake cutting and bartending service • Parquet dance floor • Creekside suite for newlyweds on their wedding night • Discounted accommodations for your overnight guests in our spacious guest rooms & suites Please review our attachment for more options.